The ‘Centre for Lifetime And REliabilty Testing’ (CLARET) in Wales has been made a reality by the Welsh Assembly Government funding through the A4B programme, which awarded the School of Electronic Engineering at Bangor University a grant of £500k to create the Centre. The main aim of the new facility is to attract outside users - specifically industry. This new industry-standard facility will provide regional and national businesses involved in the design, manufacture or integration of opto-electronic and material technologies, with lifetime and reliability testing facilities, with access to academic expertise and business support. “The UK plastic electronics sector is the World’s fifth biggest worth approximately £0.25bn. Moreover the solar photovoltaic sector, one of the eight key renewable energy technologies, is predicted to be worth £15bn to the UK by 2018. Welsh-based companies, supported by Welsh Government, form a significant proportion of both sectors and it is vital that practical, local support is readily available to help these companies reduce development times and provide better products. The project will enable the School to purchase a suite of new test equipment. These will form part of a basic functional facility at the School. After testing, the Centre will broaden its capabilities in order to create a European Large-Scale Facility. CLARET will build on activity in the School of Electronics which has been supported by the EPSRC, Royal Society, ASTUTE, Interreg and TSB to provide a new industry-facing facility at Bangor University. This new facility will complement the existing multi-million pound investments that the School has received to create a clean-room, inert atmosphere fabrication environment, laser micromachining facility and a surface analysis laboratory. This combination of facilities will be unique in the UK and Europe and the School aims to develop a European centre of excellence in North Wales. The new equipment provides a synergy with other centres across the UK. The Centre will provide an added dimension to the five Plastic Electronics Centres of Excellence (PECOEs) and major solar cell R&D centres. in the UK. 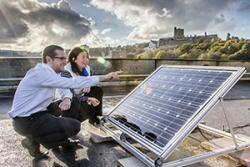 The School of Electronics, Bangor University is currently ranked 2nd in the UK for research.